Luke Skywalker holding a lightsaber for the first time. 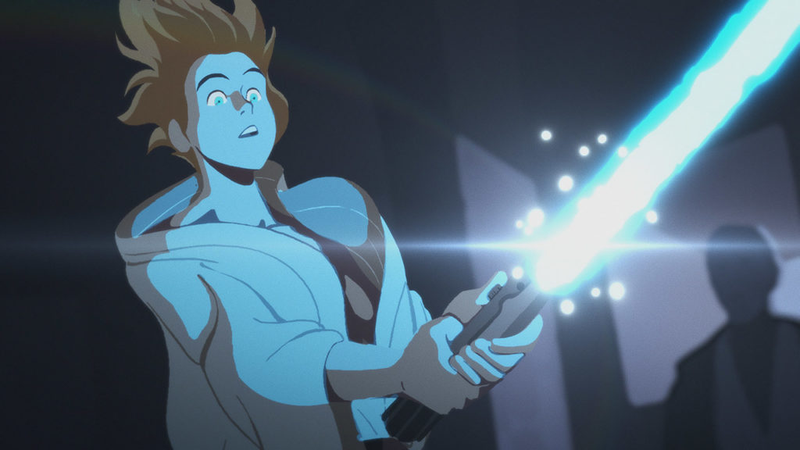 Yesterday, Lucasfilm released the first batch of Star Wars Galaxy of Adventures shorts, a series of animated shorts that pair new visuals with audio from the films, creating bite-sized reinterpretations of the Star Wars universe perfect for kids (except for the Darth Vader one, which is… kinda brutal). They’re playful, odd interpretations of their source material, and that’s the point. According to Josh Rimes, producer on the shorts, these were made to be inviting and creative takes on the franchise. 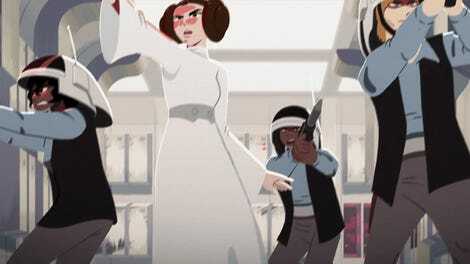 “We were looking for ways to invite young kids into the saga through exciting and vibrant bursts of animation that didn’t talk down to them,” he told Starwars.com. In particular, he talks about the way the shorts are thematically focused, playful renditions of Star Wars. This approach strikes me as a really interesting and valuable one. Like any big scifi franchise, Star Wars can take canon pretty seriously—sometimes way, way too seriously, crafting whole movies around giving it cohesion—and that can be a weakness. What’s really exciting about these shorts, beyond their being great entry points for children, is how willing they are to, well, reinterpret Star Wars. To turn those space myths into goofier, more vivid versions of themselves, framed slightly differently. The whole interview is up at StarWars.com if you’re interested, but it’s this that stuck out with me: the importance of being playful, and creative, with canon. It’s an approach keeps the old stories alive, and we need more work like it.